People wanting to upgrade their desktop iTunes movie purchases to 4K are out of luck —Apple is only streaming video in that resolution, not offering downloads, according to an official support document. "You can download a local copy of an HD movie, and you might be able to download HDR and Dolby Vision versions, but you can't download a 4K version," Apple says. The same webpage recommends at least 25 megabits per second of bandwidth for 4K streaming, and notes that falling below this may automatically switch users to 1080p or lower. It's possible to stream locally-imported 4K video from one Mac to another via iTunes, AppleInsider can confirm if properly encoded with a tool like Handbrake. So, the Apple TV and iTunes itself is capable of performing the feat. 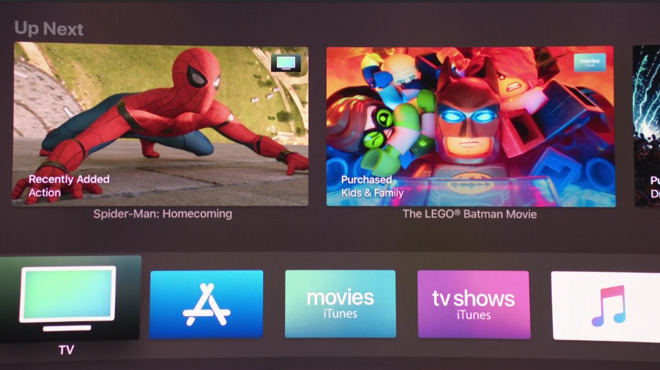 The situation is likely because of deals negotiated with most major Hollywood studios, which mean that people buying iTunes titles get 4K on the Apple TV at no extra cost. Limiting the extra resolution to streaming could be a way of deterring piracy, and/or keeping Blu-ray disc sales alive. Additionally, the Apple TV won't stream YouTube videos in 4K, and is currently missing support for Dolby Atmos surround sound, though that is said to be arriving at some point later in a software update.